Thank you I PLAY FOR SF participants for helping us make 2015 the best year yet for our charity partner Street Soccer USA! Besides these big accomplishments, Street Soccer USAÃ?Â¢? ?s coaches and mentors work with program participants on a daily basis to help them with their educational employment, and housing goals. 2016 has more in store and we look forward to seeing the #BiggerGoals Street Soccer USA will accomplish! 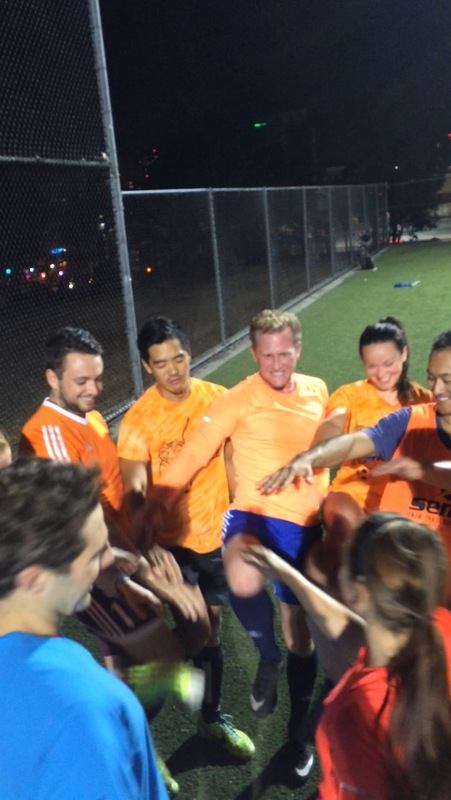 I PLAY FOR SF is an adult recreational soccer league in San Francisco. It offers Men's and Co-ed 8v8 soccer leagues throughout the year at Kimbell Playground Park, Franklin Square Park, and the Crocker Amazon Fields. All the profits from the I PLAY FOR SF soccer league go towards supporting Street Soccer USA and its program that help at-risk youth and homeless adults develop life skills and professional skills through the game of soccer. 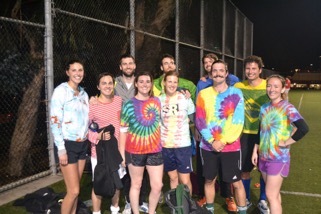 For more information about the I PLAY FOR SF soccer league, please visit this link: http://iplayforsf.org. For more information about Street Soccer USA, please visit this link: http://streetsoccerusa.org. According to several players from the team, at the beginning, they had trouble deciding what color to wear. They then decided, "why not wear all the colors?" so the team decided to get tie-dye shirts. Then, the team had to decide what type of a name to pick that goes with tie-dye shirts, so they picked "Trippin' Balls", you know, like tripping' acid, plus soccer balls, Trippin' Balls! Consequently, according to Travis of Trippin' Balls, they learned that buying tie-dye shirts from the Haight is a bad idea because it is super expensive. Therefore, they planned to have a tie-dye party, but it never worked out, so they bought tie-dye shirts on Amazon Prime. A surprising fact about the team is that eight of the ten players are from Mountain View and went to high school together. This surely looks like the team that is bound to keep swirling together for a long time. Don't trip I PLAY FOR SF! According to one member of the Soccer Bodies team and confirmed by other teammates, the origin of the team's name comes from a friendly get-together to watch Euro Cup 2012. Upon watching this match, one of them mentioned that "soccer players have the best bodies", to which they all agreed. From that moment, the ladies on the team campaigned that "Soccer Bodies" should be the name of their I PLAY FOR SF soccer team, as it is today. 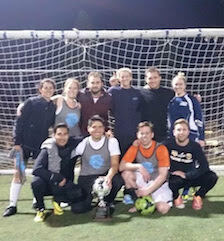 Soccer Bodies has been putting their bodies to work by never missing a season since joining the I PLAY FOR SF league in Spring 2013. That season was I PLAY FOR SF's 4th official season, so they are definitely one of the veteran teams of the league. You can usually spot Soccer Bodies with their teal-colored jerseys. Don't let the attractive teal color distract you though! With their experience, they are sure to blow past you, giving you a workout to keep up. According to Jeff of Tiger Knee FC: "This team has been called Tiger Knee as long as I can remember. It stems back actually to a team that I was on and played throughout grad school with down in Santa Barbara. If you are not familiar, Tiger Knee is one of the moves of a street fighter character, Saget, the Thai boxer. So we got the knee, and you gotta get the Tiger Knee, so we embody the spirit of the Tiger Knee. That's it." Tiger Knee FC also has a special ritual that goes along with its team name. Whenever they break out of a huddle, instead of putting their hands together in the center, they bring their knees together and shout "Tiger Knee". You will be able to recognize Tiger Knee FC by the orange uniforms that they wear. Most have the team's name with the stencil of a bengal tiger on the front. I PLAY FOR SF soccer teams, watch out for that Tiger Knee!